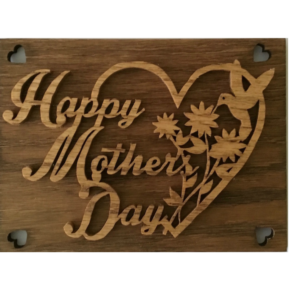 This Handcrafted Wooden Mother’s Day Plate/Plaque is beautiful and sentimental – a gift that your mother will cherish! Measuring 5 1/2 inches in diameter, the plate says “Happy Mother’s Day” around the outer rim, while the interior is a beautiful floral design. If you’re wanting a unique, thoughtful gift to give your mother this Mother’s Day, this is the piece you’ve been looking for! This wooden gift is meant to be displayed on a plate stand for maximum enjoyment. You can use your own, or choose one from our shop – your choice! – Please note, plate stand is sold separately.